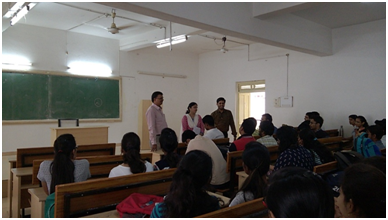 Civil Engineering Department has Students Society Civil Engineering Student’s Association (CESA). CESA is the body of students governing the activities of the department of civil engineering. It is one of the oldest students associations of the college. This body plays a vital role by arranging a plethora of events which expose students to the industrial environment. Various workshops and technical lectures are organized to nurture the abilities of students through continuous guidance from technical field experts. CESA also works on enhancing the personality of students. 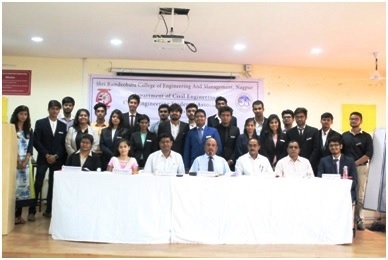 New body (2016-17) of Civil Engineering Students Association (CESA) along with Dr. A. K. Sharma, Dr. Arun Chaturvedi, Dr. M. S. Kadu and Dr. P. D. Pachpor during installation ceremony (17 September 2016). 2. Dr. Abhijeet Agashe, Dean Academics, RCOEM 2. From campus to corporate. 3. Tree Plantation Drive near RCOEM Campus. Dr. Anupam Kher discussing placement scenario with final year students (27 August 2016). Students participating in Civil Premier League (09 October 2016). Dr. Vimal Gaholt along with other Degnetaries at Inagural Functikn of NEEV'16 (15 October 2016). Mr. Tarun Shrivastav along with Dr. A.K. Sharma, Prof. P. D. Hiwase, Miss T. B. Gupta uneviling the NEEV'16 Magazine (19 October 2016). Mr. Nakul Tijare at Attitude, Attribute and Aptitude Enhancement Workshop. AAKRITI Installation of Civil Engg. Students Association (CESA) body. This event consist of several inter collegiate competitions, games and quiz. TECHNOVISION is a national level technical symposium. The event has always contributed towards the technological growth of the students. As a part of the Technovision, a technical magazine is published. Students contribute their ideas, information, new technology review etc in the magazine. 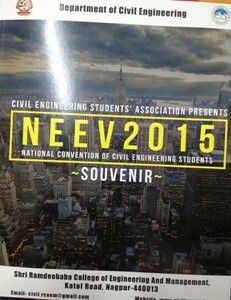 NEEV is a event to develop Technical, Organizational, Managerial, Professional, Social & Ethical Skills of students of civil Engg.. This event consist of several inter collegiate competitions and workshop where experts from industry shares their knowledge. The event consists of Tender filling, Town-O-Planner, Conundrum, CAD, Road nest (Buildcon) i.e. bridge model design contest, Elucidation i.e. paper contest etc. NEEV 2016 (2015-16) Buildcon 320 (80 Teams) First three winners were awarded with the cash prize worth Rs.5000, 3000 & 1000.